Most George Foreman grills come with drip trays that can easily be replaced. Write down the make and model number of your George Foreman grill so that you can get the correct drip tray for your particular model. 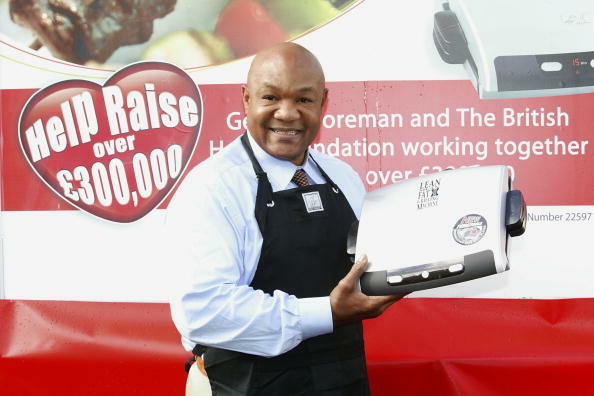 Visit the George Foreman product website: http://www.georgeforemancooking.com and click the link at the top of the page labeled "Customer Service." Select "Parts" from the menu that is displayed when you point your cursor at the Customer Service link. This takes you to the Direct Parts and Products website: link.http://www.directpartsandproducts.com/index.php, which carries replacement parts for all models of George Foreman grills. Choose the type of grill you have that needs the replacement drip tray from the products displayed on the Direct Parts and Products home page. Look for your grill's model number on the web page and click that model number link. You will be directed to a page that lists all the replacement parts for your grill. Click the "Buy Now" link to the right of the Drip Tray entry in the parts list. Enter the number of drip trays you want to buy in the "Qty." field and click the button labeled "Checkout." If you have not ordered any replacement parts from this website in the past, click the "Continue" link in the "New Customer" area. If you have previously ordered replacement parts for any of the products on this website, input your information in the "Returning Customer" area. Enter all requested information in the fields on this page if you are a new customer and create a password for your account. Click the "Continue" link. You will be directed to a page acknowledging the creation of your account. Click the "Continue" link on that page. You are then redirected to the Direct Parts and Products home page. Select the "George Foreman Parts & Accessories" link on this page choosing the type of grill you have and click the specific model number link on the following page. Click the "Buy Now" link to the right of the Drip Tray entry in the parts list. Enter the number of drip trays you want to buy in the "Qty." field and click the button labeled "Checkout." Confirm the shipping address shown on this page and enter any comments you may have in the "Add Comments About Your Order" field. Click "Continue." Choose your payment method and click "Continue." You are directed to a web page where you enter your credit card or PayPal account information. Click "Confirm Order" and you will be directed to the confirmation page with your order information. You will also receive an email that confirms your order at the email address you entered when you created your account. Call the Direct Parts and Products Customer Service number: 800-738-0245 if you would prefer not to go through the online account registration process and place a telephone order instead. You can also call the Customer Service department if you have any questions either before or after placing your order. They are open Monday to Friday from 8:30 a.m. to 8:00 p.m. Eastern Standard Time.